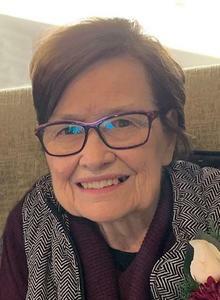 Terry McCurdy of Grand Rapids, age 80, of Grand Rapids, went to be with her Lord March 13, 2019 at Spectrum Butterworth Hospital. Born to Bob and Marge Hormuth in Traverse City, February 16, 1939, she became a believer in Christ at an early age. Desiring to serve Christ, Terry attended Bob Jones University and Blodgett School of Nursing. Throughout their years together Terry served the Lord in the local church with her husband Richard while working as a nurse and raising four children. Widowed young, Terry pursued serving the Christ she loved traveling to over 15 countries as a nurse and counselor sharing His love with everyone she met. Through her knowledge of Scripture and her musical and artistic gifts Terry taught and mentored many. She invested greatly with young people — top of the list, her own grandchildren. Terry is survived by her children Scott (Susan) McCurdy, Ellen (Ken) Fuss, Ann (Jeff) Geisel, Mary (Mike) Hain, eleven grandchildren, one great grandchild, her sister Lynn and many friends. She was preceded in death by her husband, Richard, sister Carol, and grandson Christian. A funeral will be held Monday March 18 at 1 pm with visitation one hour prior to the service at Dykstra Funeral Home — Northwood Chapel, 295 Douglas Ave. in Holland.